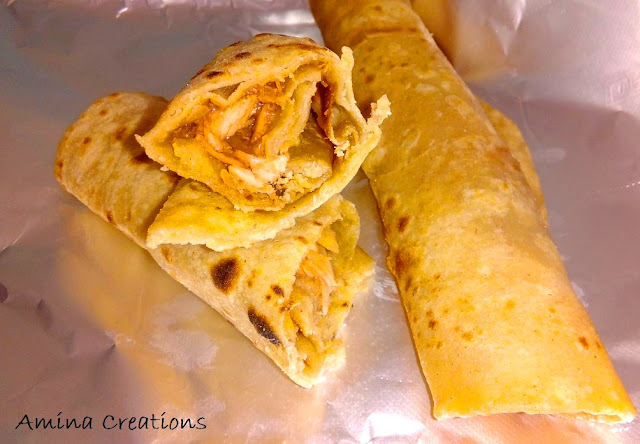 Chapathi rolls are a perfect dish for our lunch box as they are fuss free, easy to eat, and healthy. And to make these rolls even more healthy and delicious, I have used shredded chicken tikkas (baked chicken) to prepare the filling. These rolls taste absolutely delicious. You can also check my other recipe of egg and vegetable chapathi roll here. Check baked chicken recipe page for ingredients and method to prepare the chicken tikkas. Take the chicken tikkas and shred them into pieces. Keep ready. Heat oil in a pan and add onions. Cook till they turn golden. Then add ginger garlic paste and sauté for a few seconds till the raw smell goes. Next add tomatoes and cook till they turn soft and oil starts separating. Now add the salt, red chilli powder, chicken 65 masala and pepper powder and mix well. Add lemon juice and cook for a minute. Check for taste, add salt or pepper if necessary. Take the chapathis and place the filling at the centre. Nice recipe. Am yet to try preparing chicken tikka at home. I love rolls. Wheat Chapati rolls are healthier than the Maida ones.